I WAS GLUED to the TV watching the Papal Canonization of both Pope John Paul II and Pope John XXIII being elevated to Sainthood from Vatican City on Sunday, April 27, 2014. Seeing Vatican City brought back several fond memories. Ten years ago, August 2004, I took eight members of my family to Rome, Italy. I wanted my family to see Rome, Florence, and Venice staying in each city for a week. However, my main purpose for going to Italy was to see Pope John Paul II; and we did. It was a trip of a lifetime. WHILE PLANNING the trip I was able to reserve eight audience tickets to see Pope John Paul II; he held audiences with the public every Wednesday at the Vatican. On the day we were to have an audience with the Pope I received a call from a Sister informing me that he was very ill and we would not be able to see him in Vatican City. She did say we could go and see him at his summer home, Castel Gandolfo. We quickly found out where Castel Gandolfo was and how to get there by bus. WHEN WE got to the bus stop the line was already long and we were nervous about making it onto the bus. Two buses had already left the station without my family; but luckily a third bus came along. It was an odd sight because the bus was packed with brides and grooms. [It is tradition for the Pope to bless couples that married throughout the year.] A bride asked us where we wanted to go. We told her Castel Gandolfo and she said we were on the right bus. WE FOLLOWED the couples through the small town and entered Castel Gandolfo’s courtyard as we passed the Swiss Guards. The crowd was approximately 300. From a decorated platform and surrounded by several clergymen, Pope John Paul II talked to the crowd for over an hour. He spoke in Polish, Italian, French, English and Spanish. 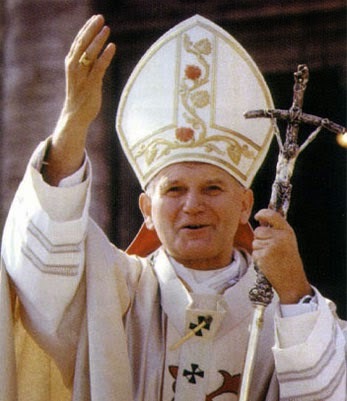 Pope John Paul II blessed us several times and he said his blessings included members of our family, our children and their children’s, children. He also blessed any religious articles and photos we had in our possession. Sadly, one could see how weak Pope John Paul II was as he struggled with his words. WHILE IN Rome, we visited St. Peter's Square, heard Mass and received Holy Communion at St. Peter's Basilica, toured the tomes of Popes buried underground, saw the Sistine Chapel ceiling by Michelangelo, the Roman Coliseum and the Catacombs. Our visit to Rome was awesome! 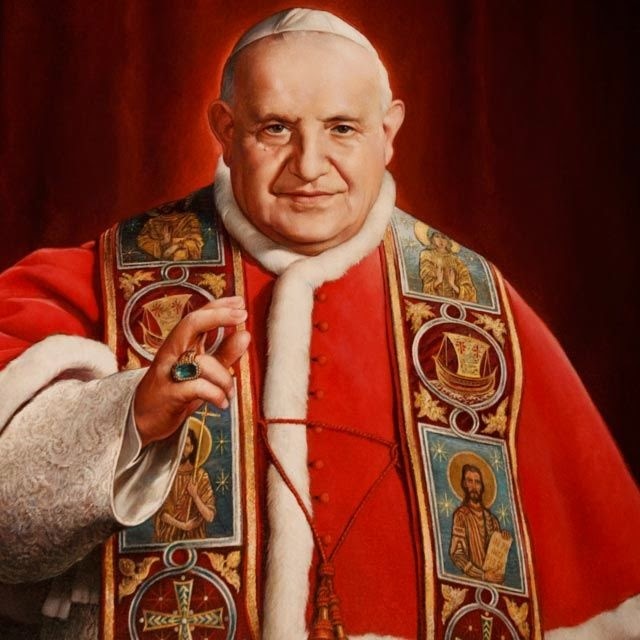 SEEING Pope John Paul II canonized as a Saint was exciting too and I can say I saw, in person, a living Saint, Saint Pope John Paul II. Jesus is whipped carrying the cross. PASSION REANACTMENT: On Good Friday, April 18, 2014, five Catholic churches in Little Village St. Agnes, Good Shepherd, Epiphany, St. Roman and Our Lady of Tepeyac joined together to sponsor “Via Crucis de La Villita” the reenactment of the Passion of Jesus Christ. The procession began with parishioners walking from 26th St. & Sacramento Ave. west to 26th St. & Kostner Ave. The crowd estimate was five thousand [5,000] Mexican Catholics (men, women and children) walking in the procession. “This was a spiritual event for the community and churches; it opens the doors for the parishes to work together in other things,” said Martin Encisco, a Deacon at Good Shepherd Church. THE REENACTMENT BEGAN at the time “Jesus” [Jaime Nieto] was taken by Roman soldiers and presented before Pontius Pilate. The criminal, “Barabbas”, stood next to Jesus when Pilate asked the crowd whom should he free. The group [actors and actresses dressed in costumes] shouted “Barabbas.” The Roman soldiers put “thorns” on Jesus' head and began pushing him to carry the wooden cross and “whipping” him. Jesus was being whipped as he carried the cross [1.8 miles] for the crucifixion. DEACON ENCISCO said “Via Crucis de LaVillita” will become an annual event in Little Village during Lent. The five churches, parishioners, coordinators and actors did an outstanding job. Vice-President; Ivan Garajas, President; Joseph Gotch, Sgt-at-Arms; Elizabeth "Lisa"
CICERO DEMOCRATS: Charlie Hernandez, Democratic Committee of the Town of Cicero held a special meeting on Wednesday, April 23, 2014 to elect new officers of the Cicero Regular Democratic Organization. Invited guest speaker was August Sallas a life-long Democrat. STATE REPRESENTATIVE Elizabeth “Lisa” Hernandez, a Cicero Democrat, also spoke to the party members about the goals of the Democrats in Cicero. Charlie and Lisa congratulated the newly elected officers. ART EXHIBIT: Carlos & Dominguez Fine Arts Gallery is presenting two internationally known Mexican artists: Hector Duarte, from Michocan, and Jesus Acuna, from Zacatecas. The opening reception will be Saturday, May 24, 2014, from 6:30 p.m. to 10 p.m. at Carlos & Dominguez Fine Arts Gallery, 1538 W. Cullerton St., Chicago. For more info call Len Dominguez 773/580-8053.